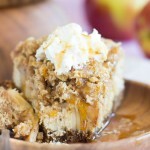 Apple crisp baked right on top of a thick, rich, creamy pumpkin cheesecake! 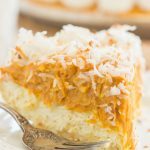 Two of the best fall desserts in one! 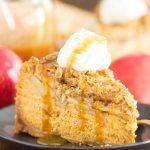 This Apple Crisp Pumpkin Cheesecake is gargantuan and amazing, and it totally deserves a spot at your Thanksgiving table! Hi, and TGIF! Tomorrow is Thanksgiving for us! I’m up in Erie, PA, for a long weekend to celebrate our annual ‘early Thanksgiving’ with my family. 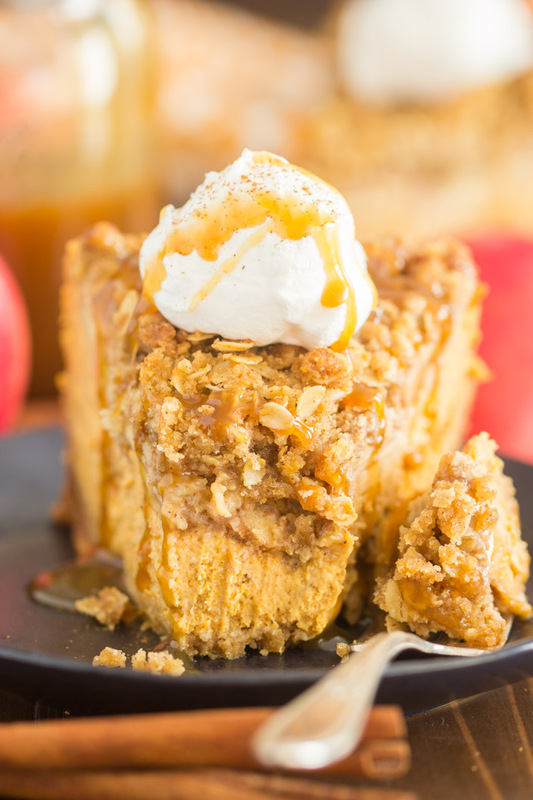 I wanted to make this Apple Crisp Pumpkin Cheesecake for our Thanksgiving dinner tomorrow, but it may have gotten bumped for classic pumpkin pies. My family is allll about tradition for holidays. I really love to experiment and try different things for our menu (as you might guess), but there are several among us that are committed to sticking with ritual! 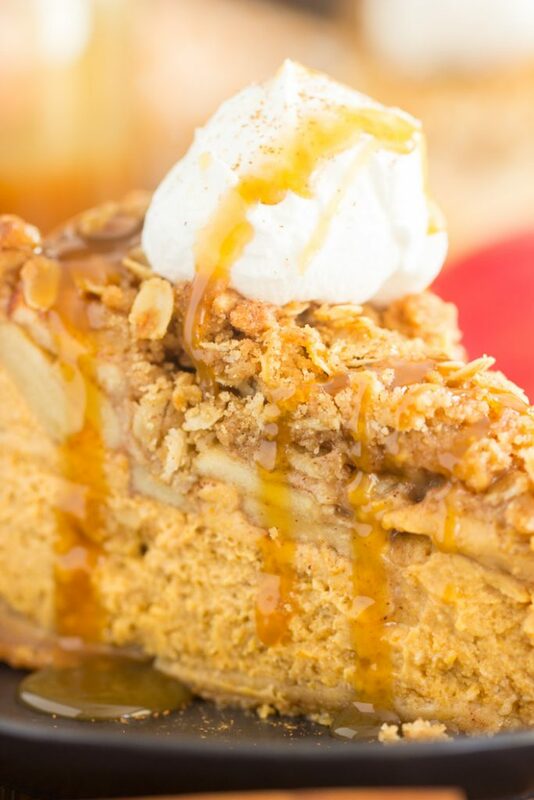 Instead of taking this Apple Crisp Pumpkin Cheesecake, or this Pecan Pie Cheesecake that I desperately wanted to make again, I think I got slated to bring a veggie side. Boooo. I’m planning to make this Cheesy Green Bean Casserole Amandine. It’s just about as easy as a traditional green bean casserole, but just a few tweaks make all the difference in elevating it. It’s great. I made this Caramel Apple Crisp Cheesecake last year, and I freaking ADORE that cheesecake. 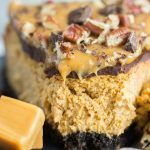 We are cheesecake people, as you know, and even among the many cheesecake recipes on the blog, that stands out as a personal favorite. I loved that I brainstormed that idea out of my head, and I then I loved how amazingly well it came together. It combines two awesome desserts in one. 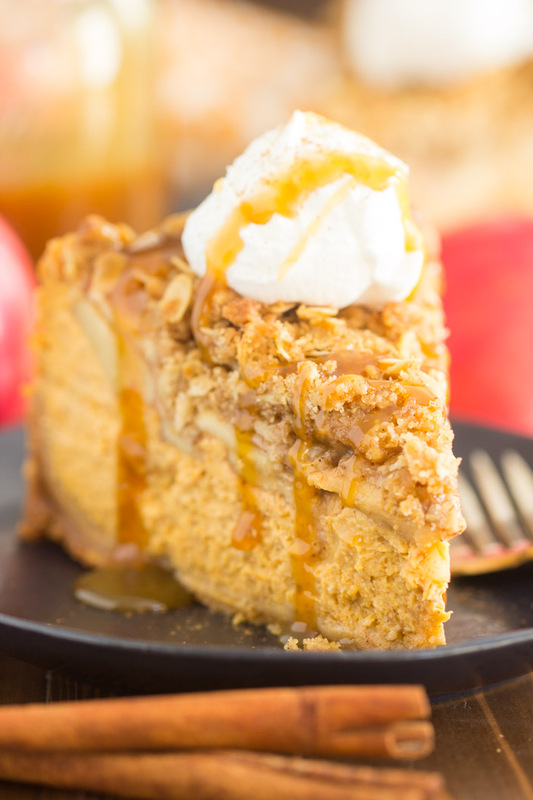 It has an oatmeal cookie crust, then a layer of creamy cheesecake – a full-size cheesecake, not a half-batch or anything short of a complete cheesecake – then it’s topped with sliced cinnamon-sugar apples, and an oatmeal streusel. It is literally apple crisp baked on top of a full cheesecake. 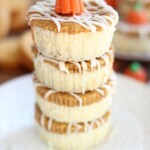 This year’s version is pumpkin cheesecake though. When I was putting together my fall recipe list, I felt like I didn’t have enough cheesecake recipes. I remedied that fast, and this is one that made the list. 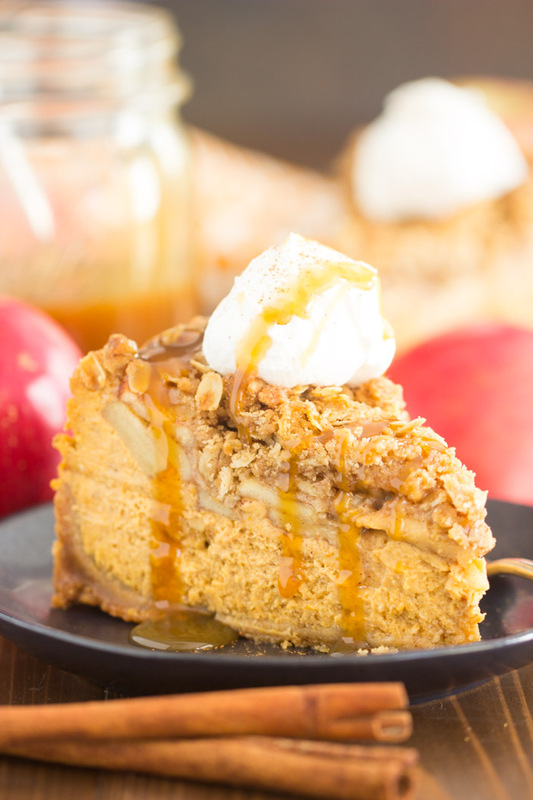 My Caramel Apple Crisp Cheesecake, but with pumpkin cheesecake. 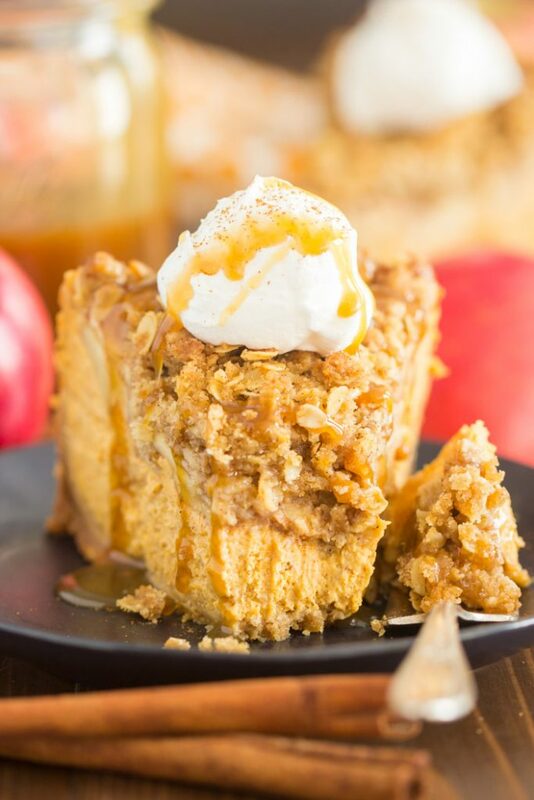 If you’re a cheesecake person, and you want to try a fall version that combines pumpkin and apples both, you’ve got to try Apple Crisp Pumpkin Cheesecake! In a medium bowl, combine oatmeal cookie crumbs, oats, sugar, and butter. Press into the bottom of a 9-inch springform pan. In a large mixing bowl, beat cream cheese until creamy. Add sugar, beating until combined. Add pumpkin puree, cinnamon, and pumpkin pie spice. Pour cheesecake batter over crust. 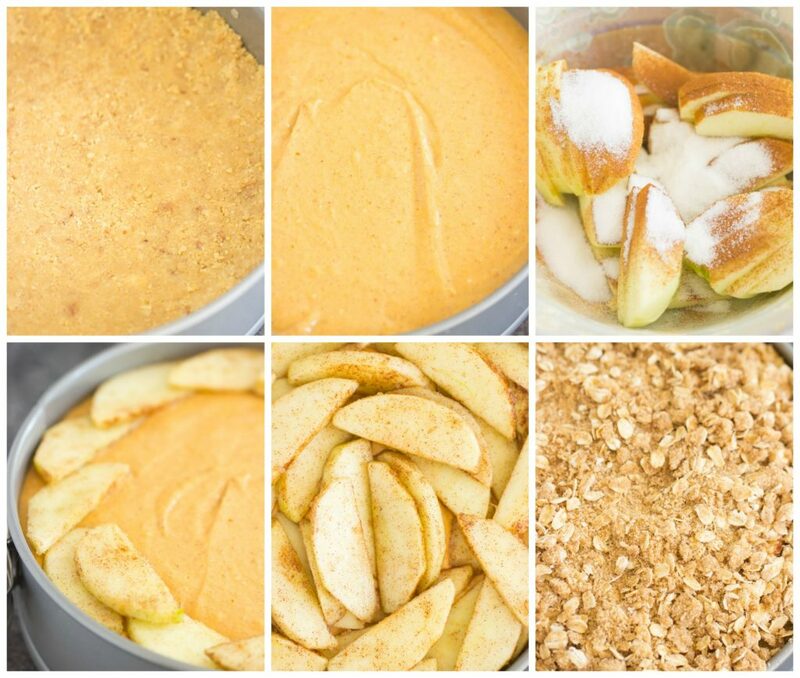 In a medium bowl, combine sliced apples, cinnamon, and sugar, tossing to coat. Carefully layer the apple slices over the cheesecake batter, working from the edges to the center - it will keep the batter from raising higher at the edges. Work from the edges toward the middle. In a small bowl, combine oats, flour, brown sugar, and cinnamon. Sprinkle it evenly over the apple layer, working from the edges to the center. This cheesecake will be up to the very top of the pan, and that's okay! It's tall, but it won't spill over! Bake at 325 degrees for 70-80 minutes (it will take a while - it's very thick), or until the center appears set when jiggled. Remove to a wire rack to cool completely. Chill thoroughly, if desired. Run a knife along the edges, and release springform pan. Transfer to a serving platter to cut and serve. Top with ice cream and caramel sauce! 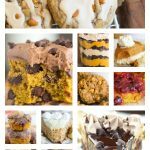 40 Favorite Pumpkin Recipes to Make This Fall!